Home > Boxing > Khan vs Brook, Khan We Just Get The Fight On….Please? I love watching Amir Khan fight…I really do. Khan is often in thrilling fights due to his instinct to trade when hurt and an unfortunate inability to hide when he himself is hurt. We all watch his fights on the edge of our seats awaiting for the inevitable drama to unfold when Khan’s opponent lands the counter. Khans brilliance mixed with an obvious vulnerability is an intoxicating mix. Fans watch open mouthed in awe of his obvious skills, then watch through their fingers as Kahn is plunged into life and death battles in almost every fight. His lovers pray he makes the bell, his haters take pleasure in seeing him exposed. However neither can turn away from the drama a Khan fight brings. Khan should be a “National Treasure”, an Olympic Silver Medal for GB, a fighter who excites the fans, a fighter that always comes to fight. However as a fighter he is somewhat unloved by the British fight fans….why? The answer in the main now leads to one place or indeed one man, Kell Brook. 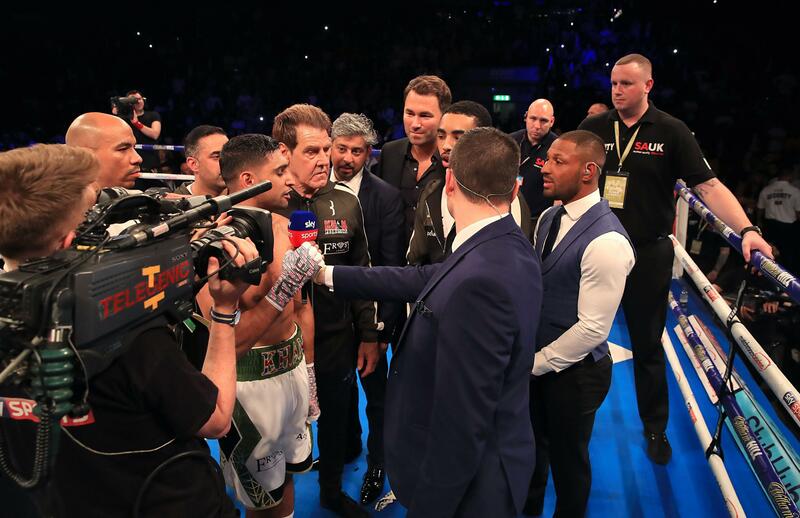 Brook has long chased Khan through Social Media, on TV and in the ring after fights. So why is their still no fight? This saga has dragged on since before 2012 and is now in danger of ending like the TV series “Lost” where fans are left confused, dismayed and ultimately with a feeling of being cheated. Unfortunately for Khan he is very much viewed as the cause of this by the fans. Brook has fulfilled almost every requirement set by Khan and now we reach a point where both fighters have the same promoter. This fight should be an easy one to make and although being another fight which is two years too late this fight still has the interest of the fans. The latest part of this “Saga” now rests on an argument over weight. Khan wants the fight at 147 lbs, which is a weight Brook struggled to make three years ago and for me (Not withstanding the outstanding talent of Errol Spence Jnr) was a factor in Brook losing the fight to Spence. Having stepped up to meet Golovkin at Middleweight he (Brook) then had to lose muscle to get back down to the 147 limit. We all remember how this sort of weight gain and then loss apparently affected the punch resistance of “Superman” (Roy Jones) and it proved in part to also be Brook’s Kryptonite. Brook is desperate for the fight, maybe too desperate. Brook has publicly stated that he will do the 147 lbs weight limit despite this having an obvious affect on Brook performing at his best. Khan is also asking for a rehydration clause or to put it in simple terms…a clause to stop Brook being too big on the night. In some ways Khan is just doing what fighters have done over the years in ensuring that the deck is stacked in his favour. Least we forget Leonard ensuring Duran had little time to prep for their second fight and importantly the time to lose the weight Duran had piled on partying in Panama? However this is now looking more to the fans as not a case of “Boxing Clever” but a case of Khan “Running Scared”. Khan has long since lost his ability to be a “National Treasure” in the eyes of the fans, however he can still give the fans what we all so desperately want. At 147 lbs a win for Khan would forever be tainted by the argument over dragging Brook to that weight. Add to this that the fight at 147 lbs would be in real danger of not going ahead. The British Boxing Board would have stringent safety checks in place given that Brook has well publicised struggles with the 147 lbs limit. It seems crazy that a promoter and indeed the fighters would plough money into something that may fall over at the last-minute. Do we really want to have bought the Popcorn and the Super Size Slushy for it to be cancelled? Social Media is calling for this fight to be made at a catch weight, desperate to see a genuine 50/50 fight between two rivals with no excuses. The Fans are fed up with excuses and the Social Media jabs between the fighters. They want real jabs to be thrown in a ring and soon….. So on behalf of the Boxing Fans around the world I plead….. Thanks for the comments. I think at 147 Khan may just get the win. I still think Brook gets it done but it’s depends on how doing 147 affects him. At a catch weight then it’s Brook by stoppage. If they ever evetually agree to fight, i can see Khan being to fast for Kell Brook. Brook has never had one punch ko power. He has grind opponents down over a period of time if the can catch them, I doubt he can catch Khan.